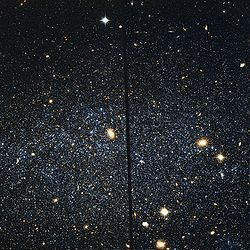 Leo A (también conocida como Leo III) es una galaxia irregular en la constelación de Leo que forma parte del Grupo Local. ↑ a b c d e «NASA/IPAC Extragalactic Database». Results for Leo A. Consultado el 19 de noviembre de 2006. ↑ I. D. Karachentsev, V. E. Karachentseva, W. K. Hutchmeier, D. I. Makarov (2004). «A Catalog of Neighboring Galaxies». Astronomical Journal 127: 2031-2068. doi:10.1086/382905. ↑ Karachentsev, I. D.; Kashibadze, O. G. (2006). «Masses of the local group and of the M81 group estimated from distortions in the local velocity field». Astrophysics 49 (1): 3-18. doi:10.1007/s10511-006-0002-6. ↑ Zwicky, F (abril de 1942). «On the Large Scale Distribution of Matter in the Universe». Physical Review 61 (7–8): 489-503. Bibcode:1942PhRv...61..489Z. doi:10.1103/PhysRev.61.489. Esta página se editó por última vez el 24 ago 2017 a las 04:02.